By adding features to commonly used chemical-engineering software packages, researchers at the University of Arkansas, the University of Akron and Chemstations Inc. have developed adaptive technology that allows blind or visually impaired students and working professionals to perform the essential functions of chemical-engineering process design. Led by Bob Beitle, professor of chemical engineering, the research team created a system that combines tactile, Braille-like representations that can be “read” by visually impaired chemical engineers. The system also includes an audio, screen-reading component and audible indicators of certain software functions. Researchers also have overcome a major obstacle associated with the user function of dragging and dropping or copying and pasting. 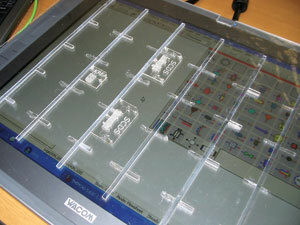 A tablet computer with a customized overlay, a tablet pen functioning as a computer mouse, and alignment holes mapped to the tactile objects help facilitate the drag-and-drop function, which is the method that connects unit operations. The researchers’ system for the visually impaired includes a screen overlay with tactiles, small objects embossed with patterns that represent various graphical-user-interface icons. The system has been tested at a process-engineering firm by graduate student Noel Romey. Romey, who has been blind since birth, came to the university to study chemical engineering. Since May, he has tested the system by simulating and designing various chemical facilities. 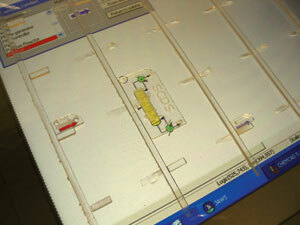 The extensive designs are used by clients of the design firm to improve manufacturing systems. In addition to the computer modifications, the research project has a psychological Beitle and his design students collaborated with Douglas Behrend, professor and chair of the psychology department, and Rachel Schwartz, a psychology graduate student. The researchers studied individuals with different communication styles and measured the reliance on vague language, visual cues and gestures. When working with Romey, sighted students seemed to modify patterns of communication in ways that suggested they were considering the dynamics of working with a visually impaired colleague. Behrend said this may be explained by group members using metacognition, defined as knowledge of and about their own and others’ cognitive processes. “This added dimension of this project will prepare sighted members of a design team to communicate effectively in a technical fashion with less reliance on visual cues,” Beitle said.